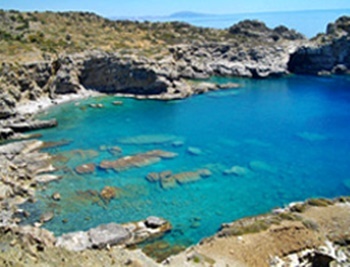 The South of Crete is not so busy as Northern Crete and has some wonderful beaches and scenery. 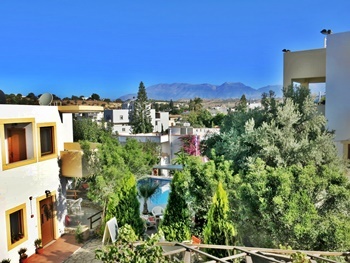 It is particularly popular with all nationalities now buying property in Southern Crete. 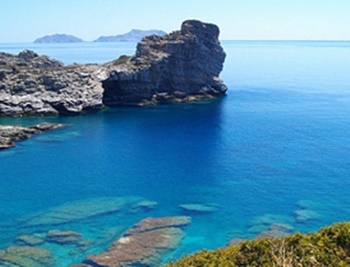 Brian has some popular English speaking agents in South Crete with some very good properties at excellent prices and many reductions, altogether a nice place to either live there permanently or go for the holidays. 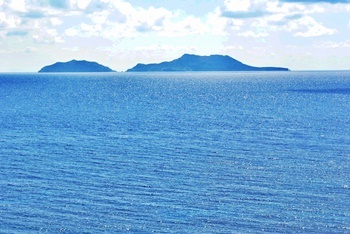 There are some very good opportunities to buy property on this part of the Island and this is only a selection. 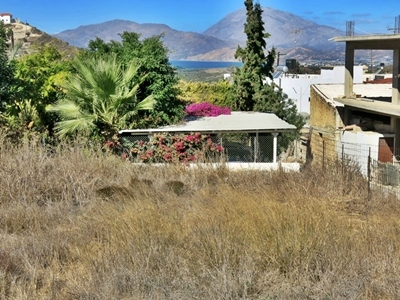 Look out particularly for refurbished properties which are now available in South Crete. 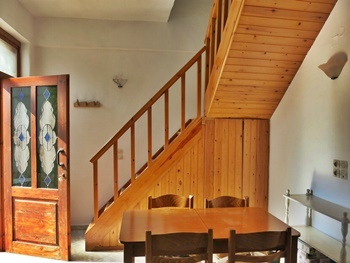 This is an attractive three storey detached villa located near the beautiful village of Sivas. 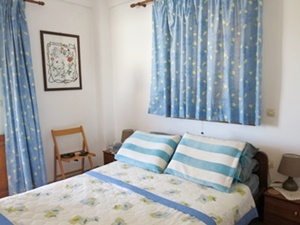 The property has three individual apartments one on each floor which provide accommodation that can be used as rent rooms or as a private home. Built in 2002 on a plot of 1600m2 Each of the apartments comes fully furnished to a high standard. 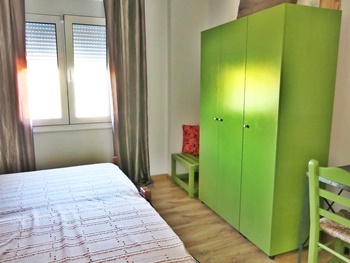 There is ample parking space and the gardens include olive groves, trees and plants which are easy to maintain. 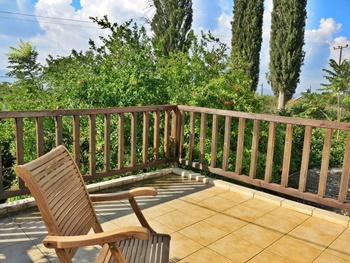 Views are towards the Psiloritis Mountains and across towards the village of Sivas. 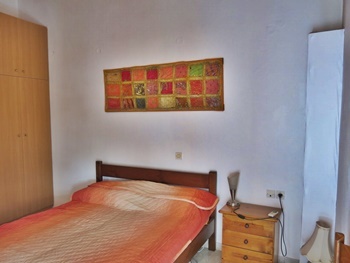 It is a short walk to the village and it is an easy drive to Mires town with all amenities, including a health centre and weekly market. 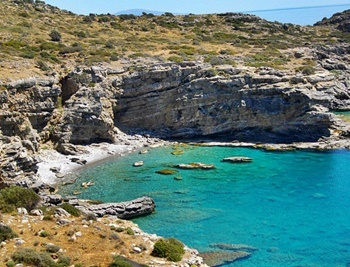 The beaches at Matala and Kalamaki and Komos are a short drive way. 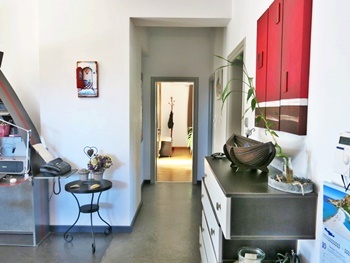 A Word Document With Full Details of Each Apartment Is Available : Please E Mail Brian and ask for CRETE LB/VSIV289 E Mail Brian. 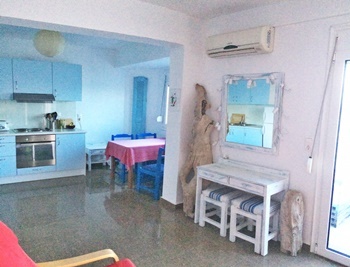 Within walking distance of the beach and village facilities at Agia Galini, this modern two bedroom house has been finished to an exceptionally high standard and offers spacious comfortable living at the upper end of the village. 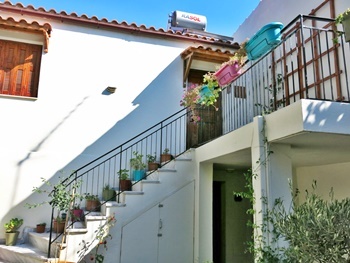 The property is on two levels and covers over 210m2 of living space with additional garden and terrace areas. Entrance to the property is through a lovely established garden area, of 26m2, with fixed planters containing established exotic plants. 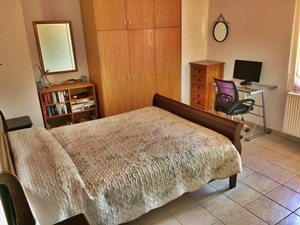 The property is very well maintained and and offers great indoor and outdoor living areas. 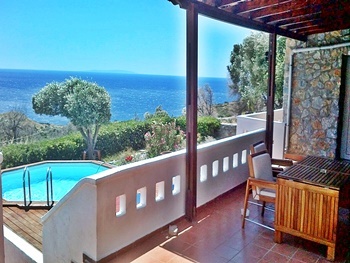 On the top floor of the house is a large roof terrace with Incredible views across towards the beach and sea at Agia Galini. 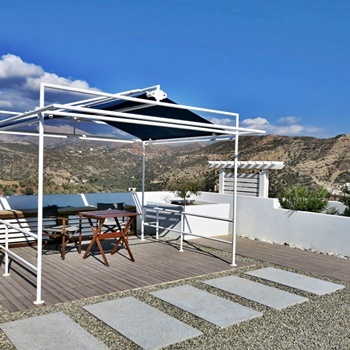 There is a roll down sun shade over a patio area suitable for an outdoor dining table, screens and wooden structures which provide privacy and shade to the rooftop area. On the ground level there is a Large bright living area with double glazed doors opening onto the terrace and a dining area with a large modern fitted kitchen with cooker and extractor. 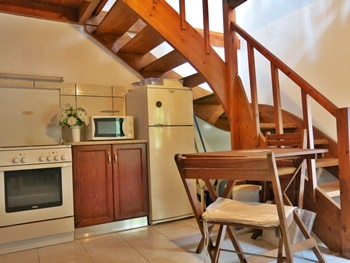 Here there is a staircase leading to the roof terrace with glazed windows, providing natural light, and one large double bedroom with built in wardrobe space and access to terrace, and one large bathroom with full bath and shower. 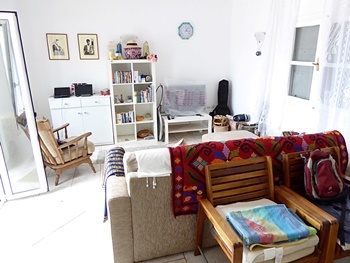 On the lower ground level the area covers 96.42m2, and is ready for conversion and could become an independent living unit or provide additional bedrooms to the existing property. 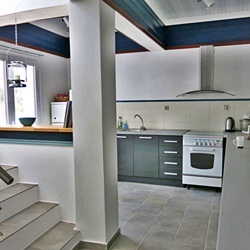 The staircase leads down to the area and all necessary utilities such as electricity and plumbing connections are ready. The useable space for accommodation has been partially plastered and has had new double glazed aluminium doors added, which open directly onto the lower rear garden and terrace, allowing plenty of natural light into the space and allowing for easy access to a perfect outdoor entertainment space. This garden area has been landscaped and is easy to maintain, with gravel pathways and planters complete with established plants and decorative white pebbles. The property benefits from : Beautiful stone tiled floors throughout : Double glazed aluminium windows and exterior doors : Solid wooden interior doors : Air conditioning units in the living area and bedroom : Solar hot water : Telephone and Internet : The property is to be sold fully furnished, Parking is available right outside of the property. 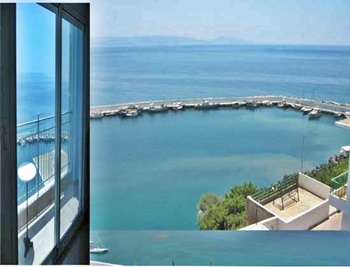 Distances : The Village and harbour with all amenities is only 350 m away and the beach 500m. 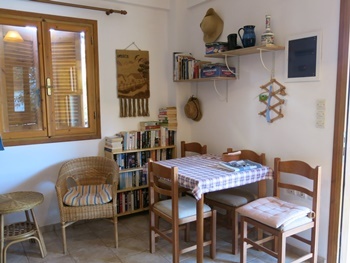 This attractive house is located in the heart of the popular fishing and tourist village of Agia Gallini Access to the property is along a lovely quiet village lane, a short walk to the tavernas, shops, beach and harbour. 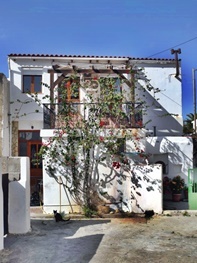 Covering three storeys (200m2 ) of living space with each floor currently used as individual apartments, the property could continue as apartments or be renovated to become one large family home. 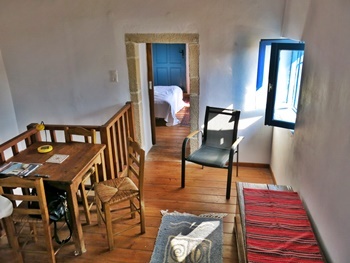 This is a restored stone house (250 years old) measuring 154m2 with a large walled and secluded courtyard of approximately 80m2 and upstairs terraces of over 30m2. 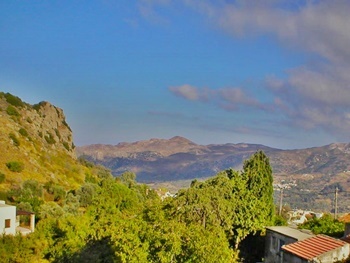 Situated at the top edge of the popular village in Mourne this spacious and comfortable three bedroom detached stone property is just 3kms from Spili and 25-40 minutes drive from the many glorious beaches stretching along the south coast, from Agias Galini To Plakias and along the coast to Rodikano. 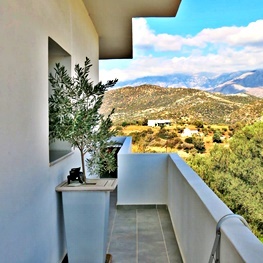 The mountains of Kedros and Psiloritis and the beautiful Amari valley are also nearby. A traditional stone archway leads into a beautiful courtyard, which is paved with the local dark green and grey flagstones and has two large walnut trees as a shady backdrop to this wonderful outdoor living area. 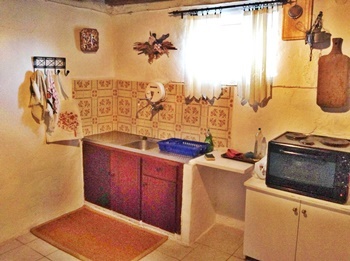 This three bedroom property is in excellent condition and has been fully restored and well maintained with further improvements added in 2017, including a new roof, new guttering and pipe work for improved water management, a new 160 litre water tank and solar panel, and a new 1,000 litre oil tanks. The exterior of the house is also newly painted. 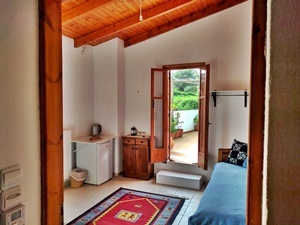 The house has been arranged so that the second and third bedrooms (with their ensuite bathroom) can be let as a self-contained suite of rooms with independent access and enables the owners to offer B&B, if desired. Equally, with the relevant permits, the house could be offered in its entirety as a holiday rental or could be a wonderful year-round living home. 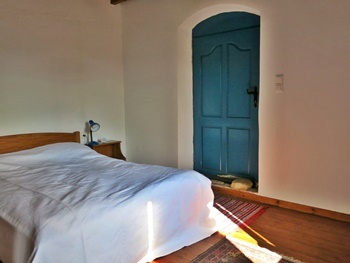 There are beautiful country and mountain views from the lounge, the bedrooms and the upstairs terrace. 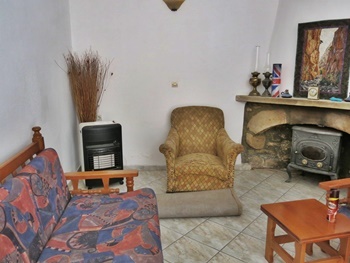 There is easy access to the internal courtyard and there is both an internal and external staircase to connect the two levels of the property.The house has full oil-fired central heating in addition to the open fire and currently has a telephone landline and good broadband service. The village of Mourne is small and popular with a varied International community. 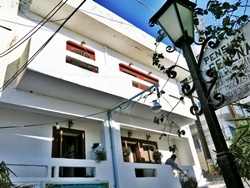 It hosts regular open air music festivals and has a pleasant social atmosphere. 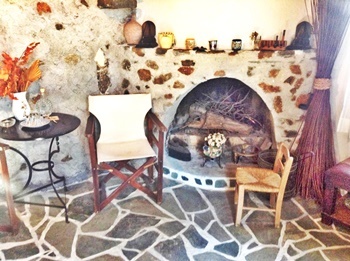 A Kafenion taverna and pop-up taverna in Mourne are within a very easy walking distance. 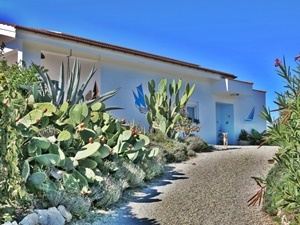 This property, comprising two adjoining villas which conform to the traditional building type specific to this village, is positioned in the countryside and offers uninterrupted views of the sea. 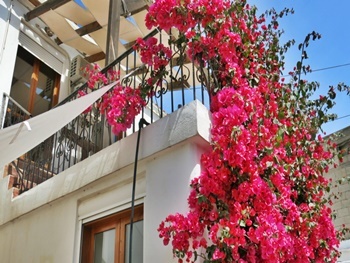 The villas have shared access to a large tiled terrace, beautiful pool area and established gardens. The location of the property provides easy access to the tavernas in the village, while the beaches of Trioptera, Agia Fotini and Agios Pavlos are within easy driving distance. 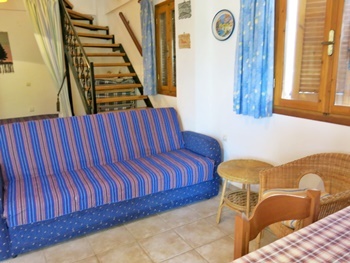 Located at the edge of the beautiful village of Agia Paraskevi This property could make an excellent holiday home with great rental potential. 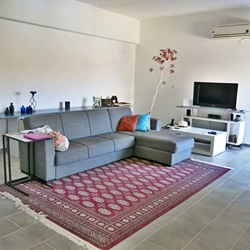 Villa One is 79sq min area and has 2 bedrooms, a bathroom, a large lounge and kitchen area, a storeroom and a large terrace which is entered from both the lounge and bedroom one. 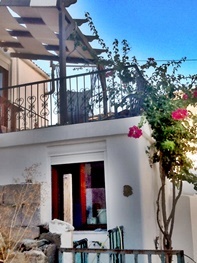 There are separate steps leading down to the garden and the pool. 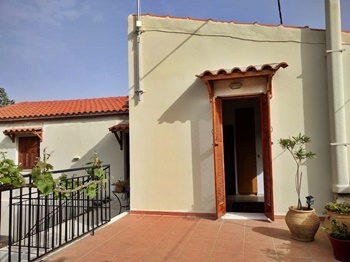 Villa Two is 73m in area and also has 2 bedrooms, one with a private terrace, a bathroom, a kitchen, a store room, there is a lounge with an entrance onto a large terrace and separate steps lead down to the gardens and pool. 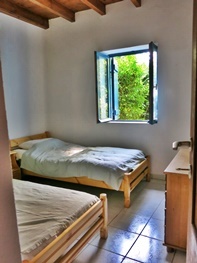 There is also a Guest Apartment of 27 sq mts with a bedroom, a bathroom, and a store room and terrace. 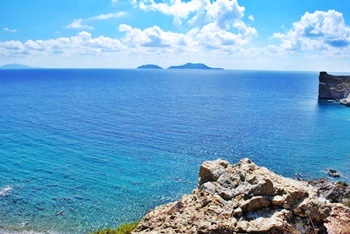 Distances: Town of Spili with health centre is 20km away and Triopetra Beach is only 3.4 kms away and the beautiful Agia Paraskevi with tavernas is only 550 mts. This is an enchanting stone house of 130 sq mts,fully furnished and decorated on a plot of 500 sq mts in the village of Nithavri, in the beautiful Amari Valley. The property has many unusual aspects, retaining many original features including wooden beams, traditional fireplace and exposed stonework, which all add to its character and charm. 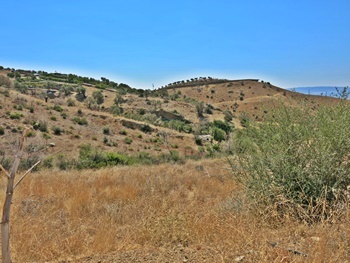 There is an opportunity to acquire a nearby piece of land with olive trees, if desired. 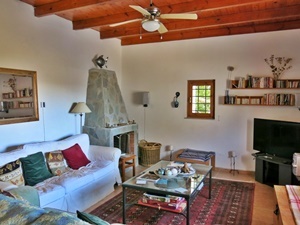 This house is set in the traditional village of Nithavri surrounded by breathtaking natural countryside : Full of character and fully furnished : Well maintained and in good condition : Traditional fireplace in the lounge : 2 bedrooms : 1 bathroom : Large kitchen : Separate dining room : Vine covered courtyard and fruit orchard garden : Secured property entirely walled and gated : ADSL internet connection available : Agia Galini is 12 kms. 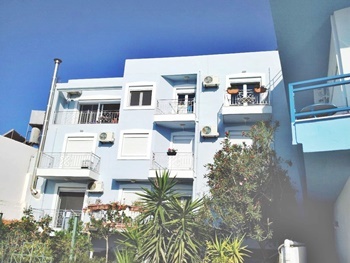 This is an opportunity to purchase a completely renovated four floor apartment block in the popular tourist village of Agia Galini. 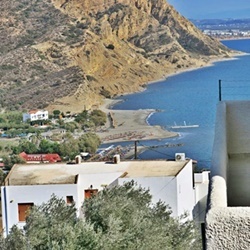 Located a few minutes walk away from the beach, and enjoying an elevated sea front position, this property is unique in its offering of sea views, accessibility to the beach and village amenities, and could continue to operate either as a business or as individual private homes. 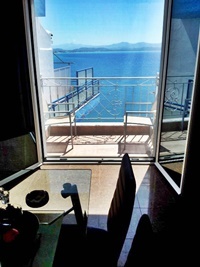 There is potential to combine the top two apartments making an exclusive penthouse apartment, giving up to 100m2 of living space and incredible uninterrupted sea views. The roof could be developed into a garden or outdoor entertainment area. 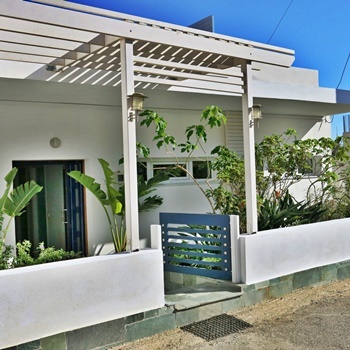 The property has a large private garden, of over 100m2, on street level, and includes a variety of established tropical plants and trees. There is adequate room to add a pool and the garden has a secure gated entrance. 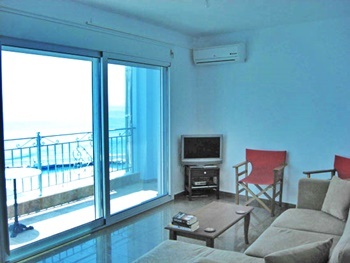 To the roadside of the property are four private parking spaces and the sea side has ample parking on a quiet road. 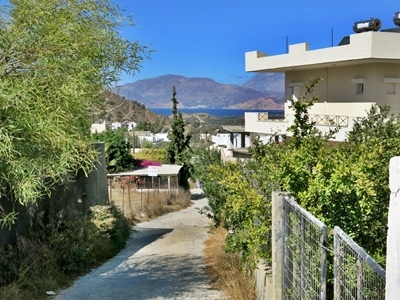 It is an easy walk both to the beach and to the village. 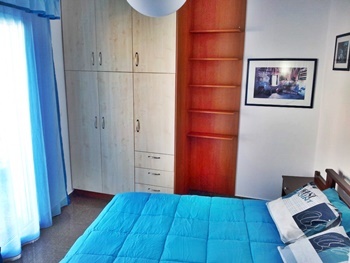 Each apartment has its own private hot water system of 200 litres, two air conditioners, and comes fully furnished and fitted, with quality products including washing machine, Bosch appliances and dishwashers. There are a total of four individual one bedroom apartments, on the first and second floors, each with its own private balcony to the front and sea facing balcony to the rear. 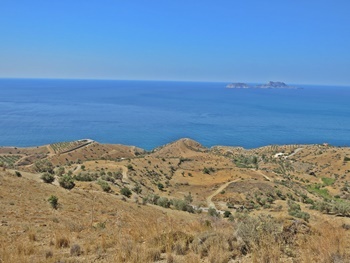 A wonderful sea front plot of 17000m2, with building rights of up to 370m providing uninterrupted views of the sea and Paximadia islands. 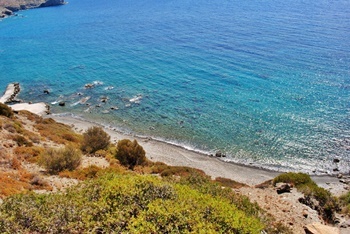 The plot is easily accessed by the road and slopes seawards with Direct access to a private beach at the bottom edge of the plot. The plot has the potential to be developed for tourism. 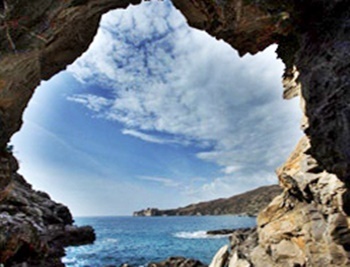 Some of the popular beaches along this coast, including Agios Pavlos with beach tavernas 1 km, Triopetra and Ligres are within a short driving distance. 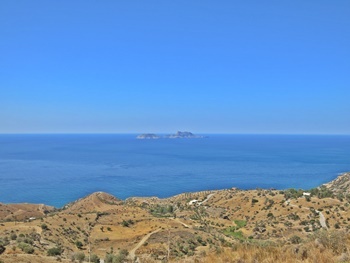 Near Agia Galini, the plot everyone asks about; a large plot of 5536.04m2 with incredible views across the countryside, towards the sea and of the Paximadia Islands, with plans (valid until 2019) for a large luxury home with swimming pool. While the plot is gently sloping, the bottom boundary drops away ensuring that the view will remain unspoilt in the future. 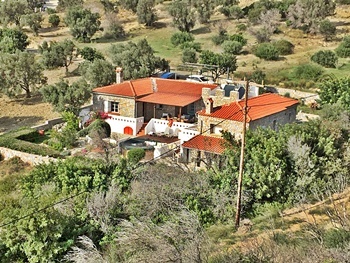 The plot is situated directly off the main road from Agia Galini to Melambes providing very easy access. 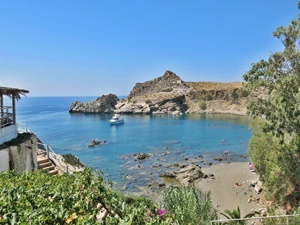 Beaches and tavernas at Agios Giorgios are a short drive away and further along the coast are the wonderful beaches at Triopetra, Agios Pavlos and Agia Fotini. Building plans are valid for a luxury four bedroom house with swimming pool and are available on request. 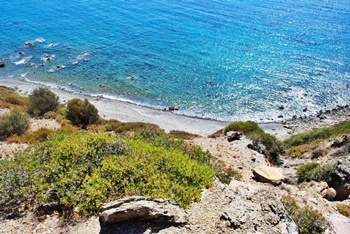 A fabulous plot a short walk away from the beach at Agios Giorgios. 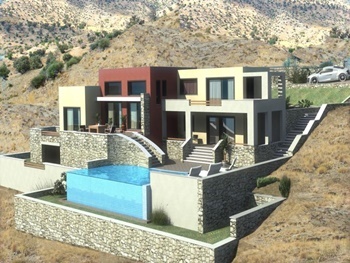 The plot measures 8815m2 and it would be possible to build a house of up to 240m2. 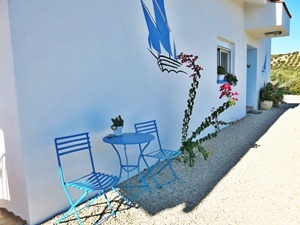 Located along a walking path from the main road leading to Agios Giorgios beach the plot is surrounded by nature and has a lovely sea view. 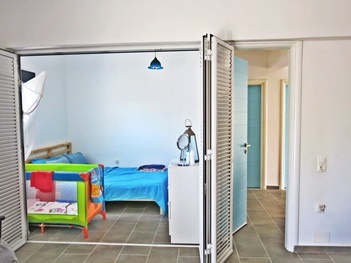 The beach and tavernas are only 600 metres away and Agia Galini is only 6.8 Km. 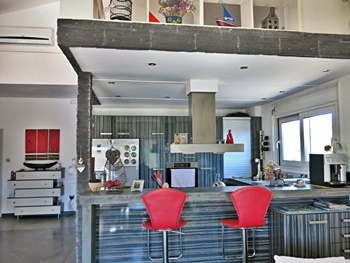 The plot is relatively flat and occupies an elevated position, providing wonderful un-interrupted views towards the sea and down towards the village of Agia Galini. 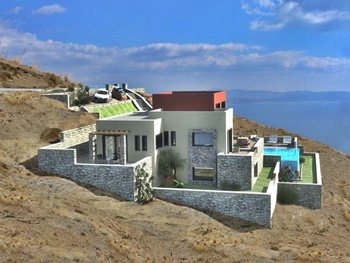 The plot measures approximately 3550m2 and has the potential to build a property of up to 150m2 . 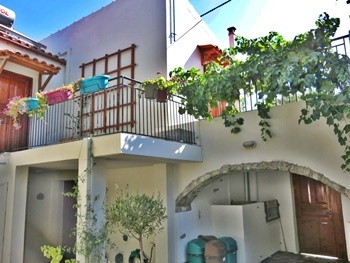 Access to the plot is from the main road leading to Agia Galini and Agios Giorgios and there is a well maintained agricultural road which enables easy access directly up to the plot. This is an opportunity to purchase a large plot of 11,000m2 with an established photo-voltaic business (1600m Sq mts) located in the countryside near Klima The photo-voltaic park generates a yearly income details of which are available on request. This will run until 2037. The plot adjoins a road and is easily accessible. There would be building rights of up to 380m2 for a private home. 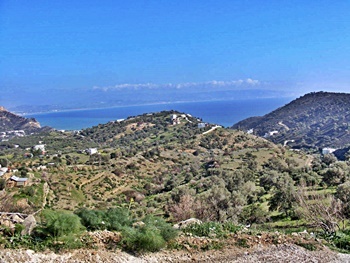 Klima Village is only 1.7 Kmsaway. 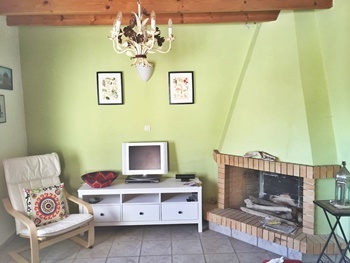 This lovely renovated stone village house (90m2) with a private courtyard and shaded upper terrace is situated along a quiet lane in the popular village of Kamilari. 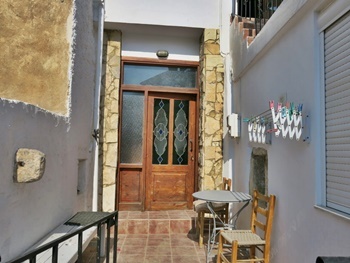 The entrance to the property is through a gate which leads to a small private tiled patio terrace, a perfect place to sit and relax. 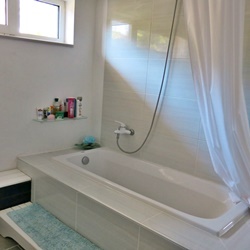 The property comprises on the lower level a lounge with fireplace and chimney with wood burner installed, and a traditional niche as a feature arched doorway to the fitted kitchen a wet room/ shower room with hand basin and a private patio. 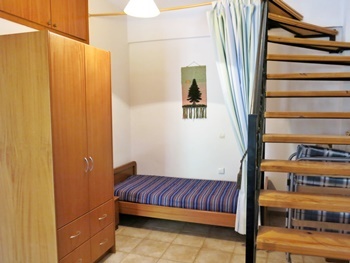 On the upper level there are 2 bedrooms with fully fitted wardrobes, air conditioning and roll down shutters on the doors and a tiled shower bathroom. 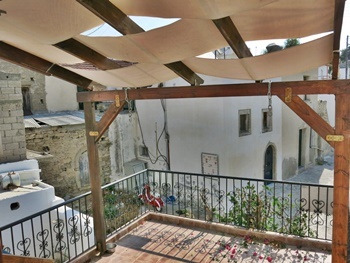 Both bedrooms have direct access to the upper terrace with canvas canopy and pergola. The tavernas and supermarket are within 90 metres away and it is only 3 kms to Kalamaki Beach. 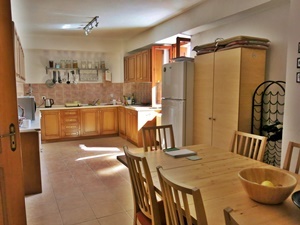 The property could be a wonderful easy to maintain holiday let or private home. 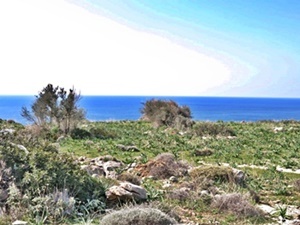 This lovely plot of 700m2 is gently sloping and is located at the top of the village, offering superb views towards the beach and across to the sea. The plot is directly alongside a road and is easily accessible. 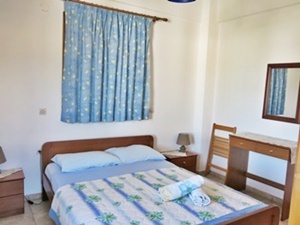 All amenities in the charming village of Agia Galini are within easy walking distance, as are the school, beach, local shops, tavernas, and harbour. Timbaki Town is 12 klms. 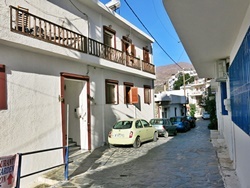 An opportunity to purchase a property of approximately 400m2 in the centre of Agia Galini village. This property once operated as a rent rooms accommodation and has retained its hotel licence, but could also be converted into a wonderful exclusive large home or individual apartments. 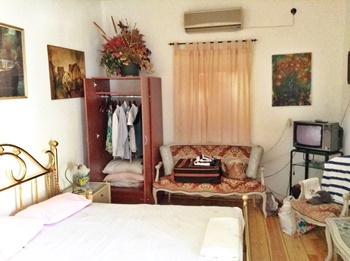 The property is currently used as rented accommodation. 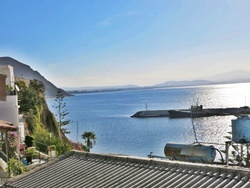 Covering four floors with views across the village and towards the harbour the property has balconies on all levels and a lovely large roof terrace on the top floor providing a wonderful sea view. 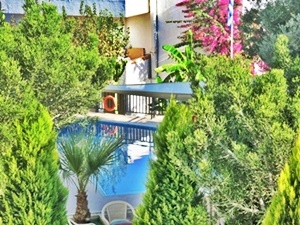 The property comprises : A Basement of 110m2 with a large open area with toilets : Ground floor 110m2: 4 rooms with shower bathrooms and balcony and a large one bedroom apartment with open plan living area, kitchen and bathroom and balcony : First floor 110m2: with 6 rooms with shower bathrooms and balcony : And on the top floor 90m2: 6 rooms with shower bathrooms and large roof terrace : The property requires modernisation but has great business potential. 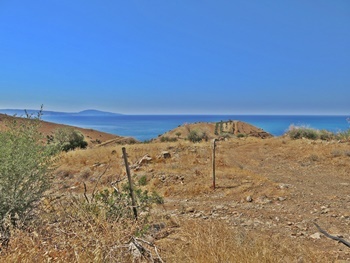 We are delighted to be able to add this plot of 6740m2 with building rights of up to 230m2 to our listings in this sought after part of the south coast. 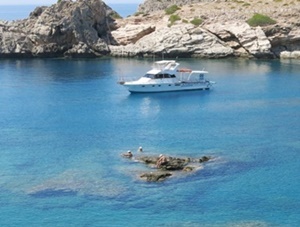 It is close to the sandy beaches of Agios Pavlos and Triopetra with popular small summer coastal coves and tavernas. 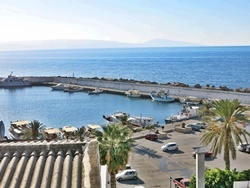 The village of Akoumia with attractive village square and tavernas is a short drive away. 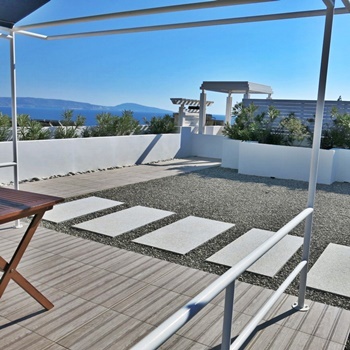 In a direct line, the plot is only 100 metres from the sea, this ensures beautiful views across the sea and bay. 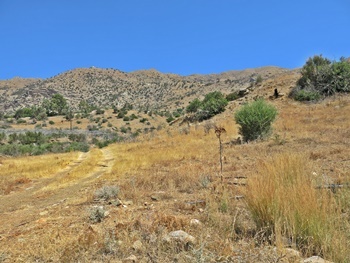 The property is amazingly well priced for this particular area and being almost level makes access from the road easy and building costs would be lower. Electricity and water connections are nearby. 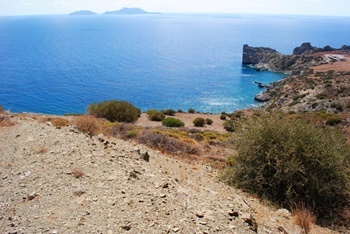 An opportunity to purchase an exclusive plot of land with direct access to the sea, near Agios Pavlos, South Crete. 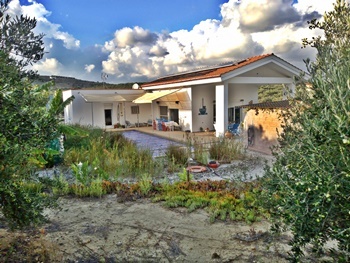 The plot has building rights of up to 280 sqm. 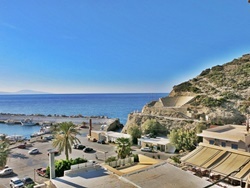 The position of this sea front plot guarantees amazing, uninterrupted views across the sea. 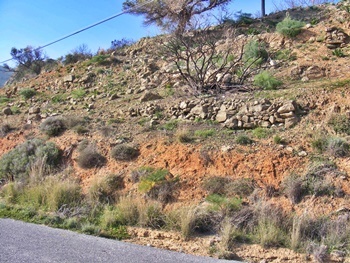 Included in the price is: the plot of land at 8784sqm, electricity connection, water supply and driveable road. This plot will have it’s own private stairway down to a rock shelf, which can be used to access the sea. 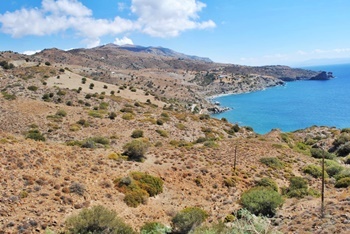 An opportunity to purchase a private plot of land with direct access to the sea, near Agios Pavlos, South Crete. 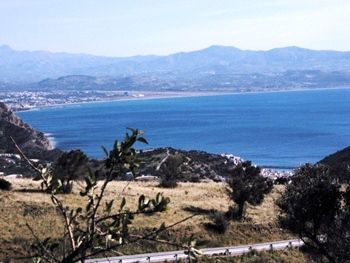 The position of this plot offers uninterrupted views across the sea and has building rights up to 260 sqm. 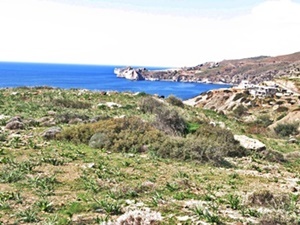 Included in the price is: the plot of land at 7633sqm, electricity connection, water supply, a driveable road and a staircase down to a private rock shelf, where the sea can be accessed through a cave. 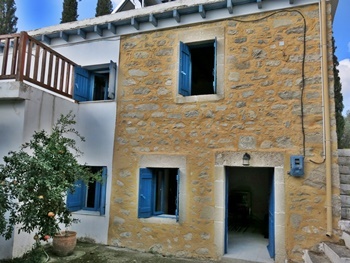 This is a traditional two bedroom stone village house built in 1900 and fully renovated in 2004. 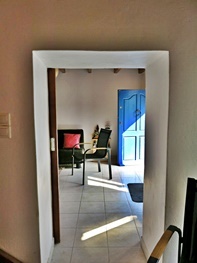 Covering two floors of living space approximately 380m2 situated along a quiet lane in a lovely small village. 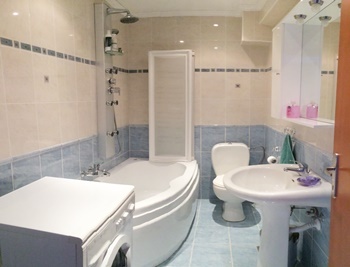 Ground floor : Sitting room : Kitchen with dining area : Tiled bathroom with shower and plumbing point available for a washing machine : One double bedroom with view of garden : Large front terrace with traditional oven : Private garden with stone house for further renovation. First floor : One double bedroom with stone doorway and traditional wooden door that leads to an external stone staircase : Terrace providing good views over the garden : sitting room/study with wooden staircase. 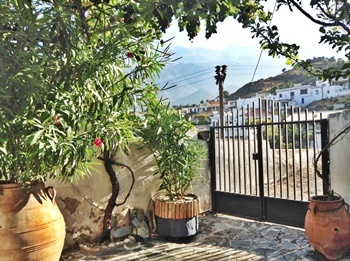 Garden : The property has a lovely garden with mulberry, orange and pomegranate trees and there is a separate stone house ready for conversion to a guest annexe. 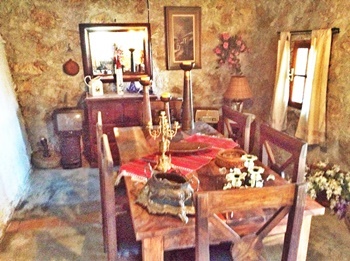 : Situated along a quiet village lane there is room for parking at the property. 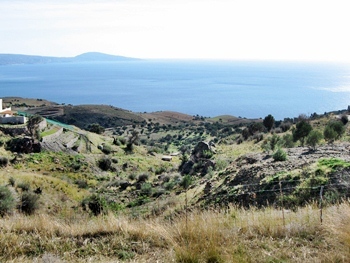 Terraces : The upper terrace has non slip tiling and allows for views of the village, the Asterousia mountains and the acropolis at Gortyna. There are also attractive views across the quiet village lane and over the private garden area. 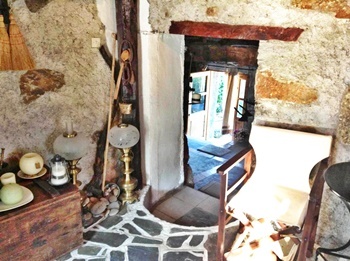 To the front of the property is a large outdoor space with and old bread oven. This could be a useful area for outdoor entertaining and has a pathway that leads to the rear garden and the stone house for renovation. Ambelouzos is a pretty village on the edge of the archaeological site at Gortyna, the Roman capital of Crete. A new museum, a short drive away, will be completed shortly. 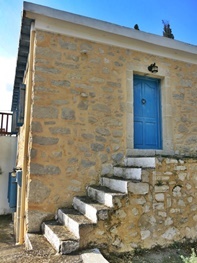 In the village there is a traditional taverna and a small shop which opens in the evenings. The popular market town of Mires, with supermarkets and a health centre, is a short drive along the main road. 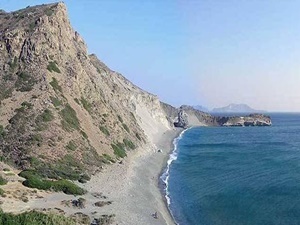 Plans for the opening of the new highway will decrease the travel time to Heraklion and the airport, which at present is a 50 minute drive away. 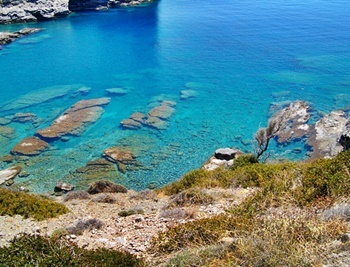 Some of the beautiful beaches in the area including Matala, Kalimaki and Kokkinos Pirgos are 30 minutes away. 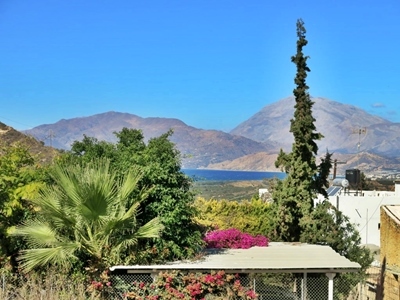 Zaros with a beautiful lake, tavernas and walks is 20 minutes away. 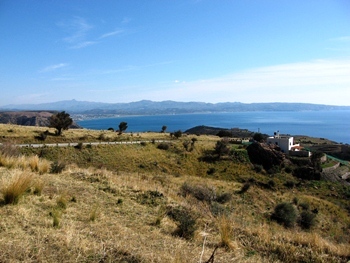 We are pleased to offer this buildable plot in this popular Village of Kamilari with sea views. This plot is situated in the Centre of the Village. 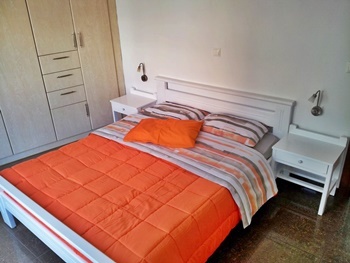 It is only 2 minutes by foot to the supermarket and many traditional Tavernas and Kafenions. 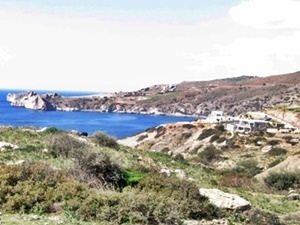 Plot size 511 square metres with a village building allowance of up to 400 square metres. 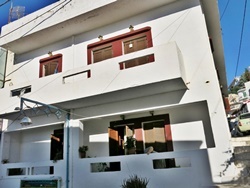 It is situated only 2 klms from the beach and 9 klms from Matala. 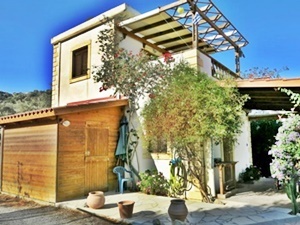 Two detached furnished villas each 55m2 adjacent to one another in the popular village of Pitsidia which has many tavernas and is a short distance to the wonderful beaches of Kommos, Kalamaki and Matala. 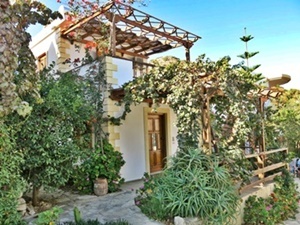 The villas, built in 2003, Could be used as holiday rental or permanent homes and have been maintained to a high standard. 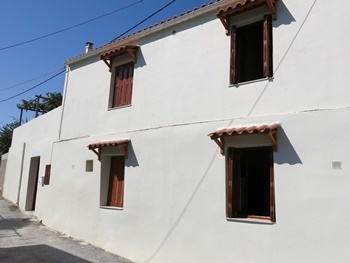 The properties are situated along a private lane and are in a quite cul-de-sac area, each on an individual plot with private driveway and parking area. 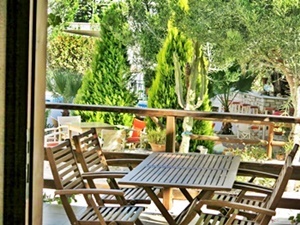 Opposite the villas is a pool with a bar area (serving snacks ) which residents and visitors to the villas are welcome to use. 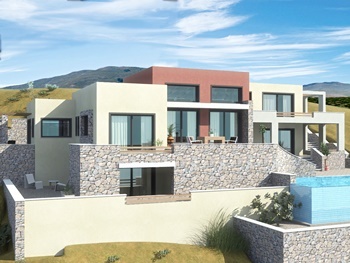 There is also opportunity to purchase each villa individually which could also operate as a rental or private home. Details can be found atVP275 and VP276. A Word Document With Full Details Is Available : Please E Mail Brian. : E Mail Brian.
. This attractive villa could be used as a holiday rental or permanent home. 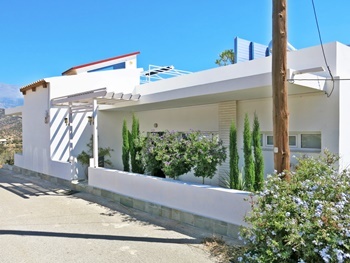 The property was built in 2003 and is situated along a private lane in a quite cul-de-sac. 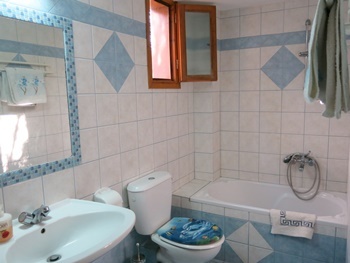 It is on an individual plot of 96.53m with private driveway, garden and parking area. 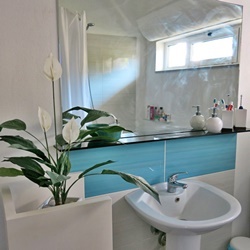 The property and garden area have been maintained to a high standard. Opposite the villa is a pool with a bar area (serving snacks) which residents and visitors to the property are welcome to use. 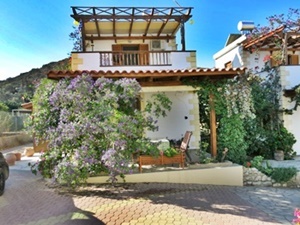 The property comprises a 55 sqm villa on two floors on a plot of 96.53m. 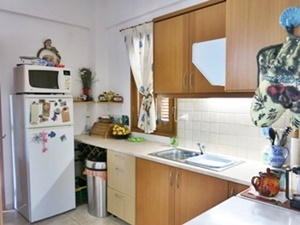 On the ground floor there is a lounge-dining area fitted kitchen bedroom area with wardrobe family bathroom with laundry area patio area with pergola parking garden external wooden structured storeroom. 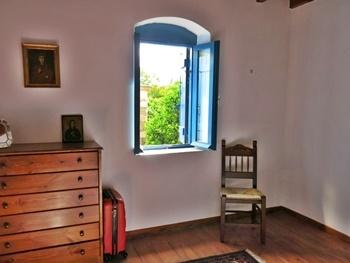 On the upper floor : there is a bedroom with en-suite shower room : a private terrace with pergola and views of the village and mountains : The villa has wooden frames and shutters on all windows. 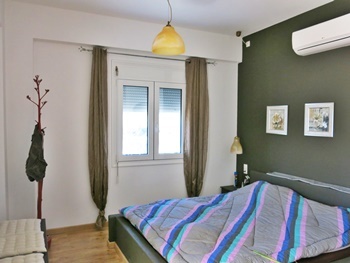 Air conditioning units with hot and cool function are in the property and there is a solar water tank and panel on the roof. 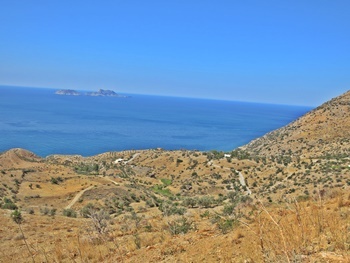 Pitsidia village has many live music events over the summer season and celebrates many local festivals making it a very popular location. 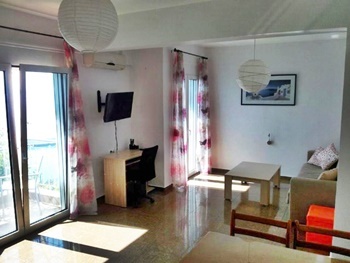 There is also opportunity to purchase the neighbouring villa VAG276 which could also operate as a rental business or as a private home. 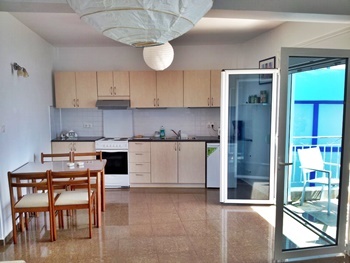 Details for purchasing the two villas together can be found at H024. 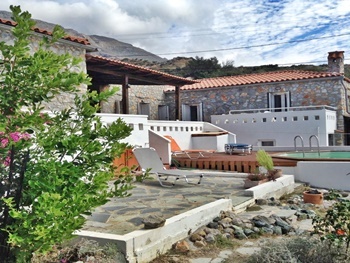 This is a detached furnished villa of 55m2 in the popular village of Pitsidia which has many tavernas and is a short distance to the wonderful beaches of Kommos, Kalamaki and Matala. 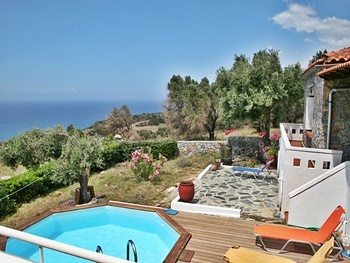 This attractive villa could be used as a holiday rental or permanent home. 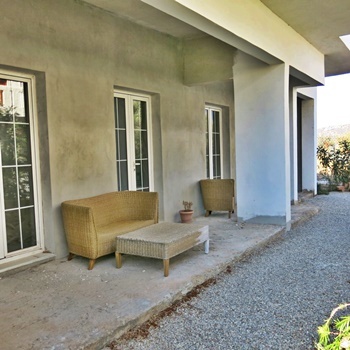 The property was built in 2003 and is situated along a private lane in a quite cul-de-sac. 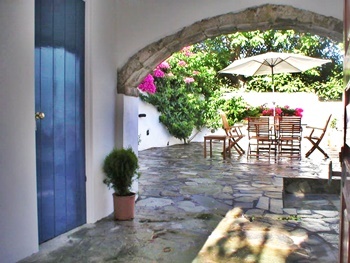 Te villa is on an individual plot of 106.13m2 with private driveway, garden and parking area. 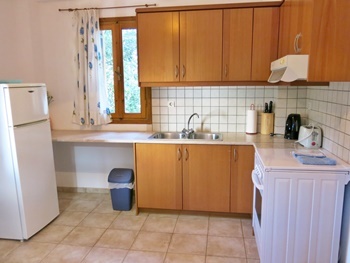 The property and garden area have been maintained to a high standard. Opposite the villa is a pool with a bar area (serving snacks ) which residents and visitors to the property are welcome to use. 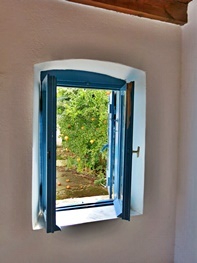 All windows are wooden frames with shutters. 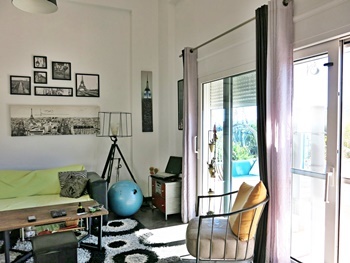 The Air conditioning units are with hot and cool function and in the property is a solar water tank with panel on the roof. 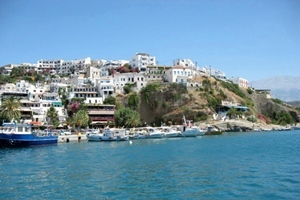 Pitsidia village has many live music events over the summer season and celebrates many local festivals making it a very popular location. 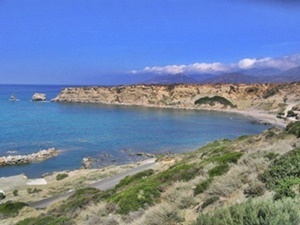 This is a plot of approximately 2000M2 with magnificent views of the bay of Messara and of the village of Agia Galini. 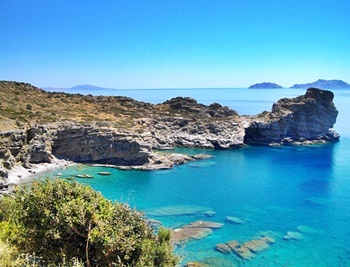 The beaches at Agios Giorgos and Agia are only a few minutes drive away. 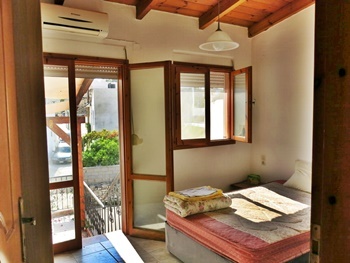 It is approximately one and a quarter hours to the main airport in Heraklion and 25 minutes to the big market town of Mires. 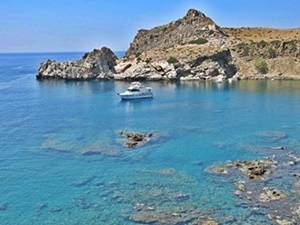 The village of Agia Galini has every necessity for everyday needs and it a popular tourist resort with a relaxed lifestyle. 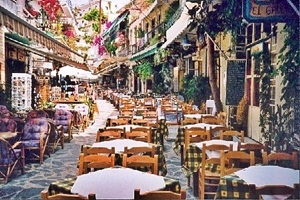 It has many good tavernas, shops, mini-markets, hairdressers and bakeries and of course tradition coffee shops. The plot is accessed from the tarred road and the land is gently sloping which would be make for an easy build. 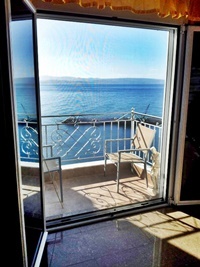 The views can never be compromised. Water and electricity are close by. 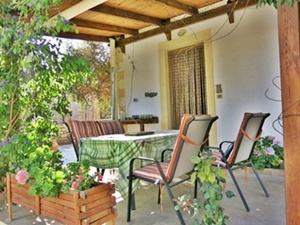 A very attractive and spacious single storey villa of 146m with a large swimming pool, and an olive grove with many olive trees, and surrounding gardens. 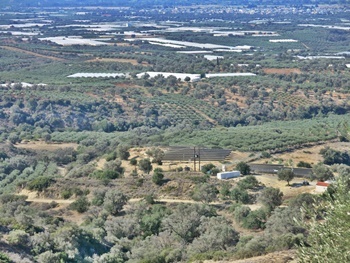 The large plot is approximately 9250m and has many established olive trees which produce a good quality olive oil. 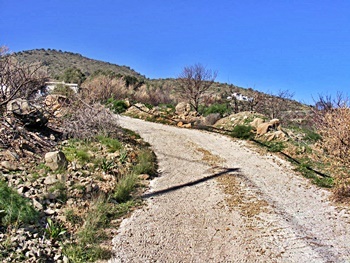 Entrance to the property and grounds is along a gravel stone driveway with a secure electric gate. 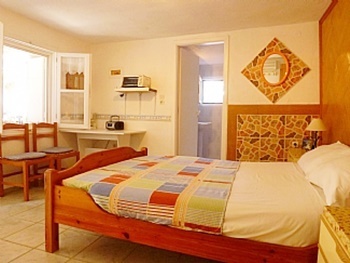 There is ample space for parking and the villa and gardens are private. 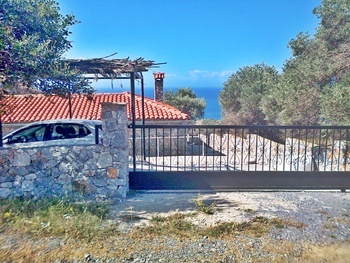 Situated near to the villages of Sivas and Kamilari this property is ideally positioned for easy access to Pitsidia Pombia and Mires : Local beaches in the area include Komos, Kalamaki and Matala are only a short drive away. 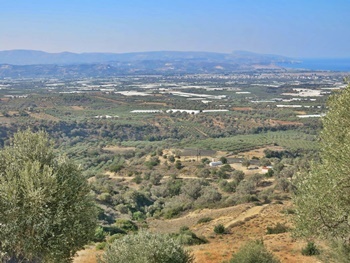 The Gardens and special features : The plot is approximately 9250m and has many established olive trees which produce a good quality olive oil. Flowers and fruit trees have been well maintained and yield fruits including lemons, apples and figs. There are many different flowers and plants which make the outdoor area very attractive. 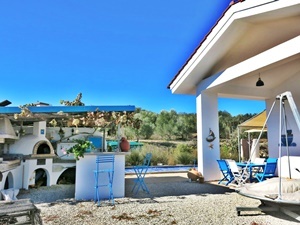 There is an outdoor kitchen and barbeque area with wood oven, and seating, which is perfect for entertaining. A large covered patio surrounds the front and side of the villa and includes the large swimming pool (12x4m) which has a full length weather covering. There is ample room for sun lounge's and garden furniture around the poolside. 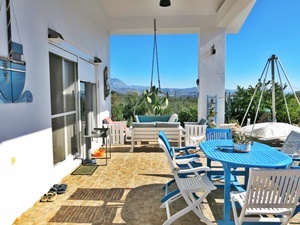 To the front of the villa is a patio area with outdoor swing chair and table and chairs, which is a lovely relaxing area to enjoy the views of the gardens. BACK TO HOME PAGE. CRETE SOUTH PAGE 2. CRETE SOUTH PAGE 3. E MAIL BRIAN.